Using the same 1GHz dual-core NVIDIA Tegra 2 processor used by its bigger brother, there’s no arguing that there’s enough power to launch the Acer ICONIA TAB A100 into the stratosphere with minimal effort. Add its 1GB of RAM and smaller 7-inch display into the mix, it’s undeniably expected to translate to a flawless experience out of the box – even more when it’s one of the few currently available tablets to run Android 3.2 Honeycomb. Playing with the tablet briefly out of the box, we’re digging the fluid and smooth movement it’s exhibiting right away. Moreover, we’re able to navigate across the homescreen in portrait with a live wallpaper activated with no detrimental levels of slowdown or lag being witnessed. Call it a relief or something, especially when other previous tablets exhibit choppy movements in portrait navigation, we’re undoubtedly enchanted to see it running at a good pace. 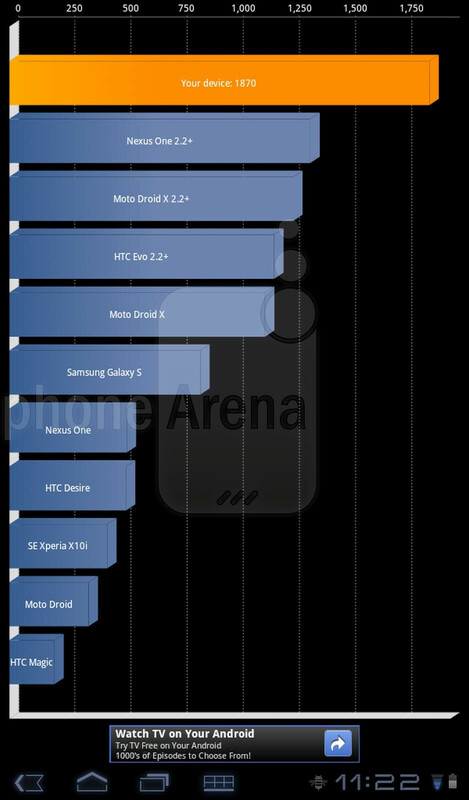 Running the Quadrant benchmark app on the ICONIA TAB A100, it’s able to muster up scores ranging between 1,788 and 2,075. 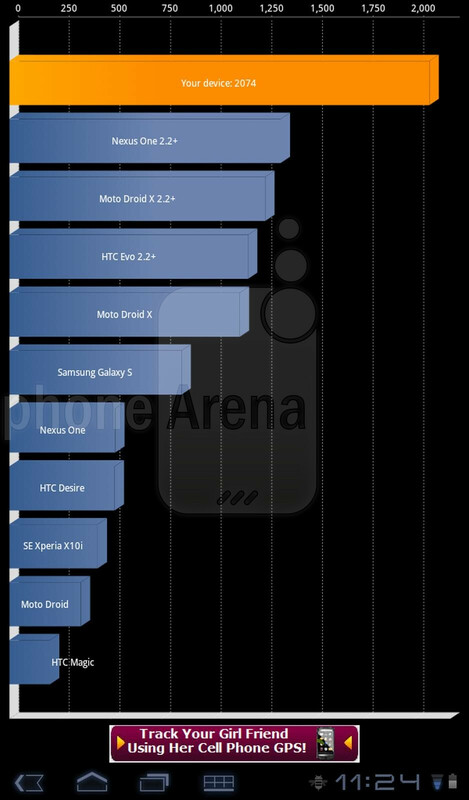 Obviously, they’re good, but nothing great when you compare it to the 3,000 and above scores put up by the Samsung Galaxy S II. Nevertheless, they’re simply only benchmark scores – so it's up to the individual to realize if they're worth believing. 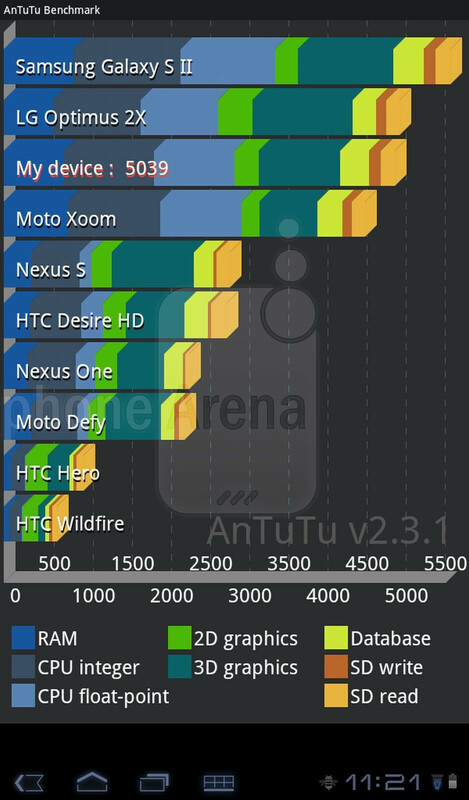 Secondly, we’re able to see the tablet cough up a total score of 5,039 on the AnTutu benchmark test. Again, it’s an admirable score, but nothing mind-blowing. In the short time playing around with the Acer ICONIA TAB A100, we’re content by its performance and execution so far, but of course, we’ll be handling it more extensively to better gauge its overall performance. I really like the design of this tablet--narrow bezel on the sides & bigger on the ends so you can easily hold it with one hand in any mode. Just wish it had an HD screen and maybe about 8" screen. That would make for a great size highly mobile tablet.